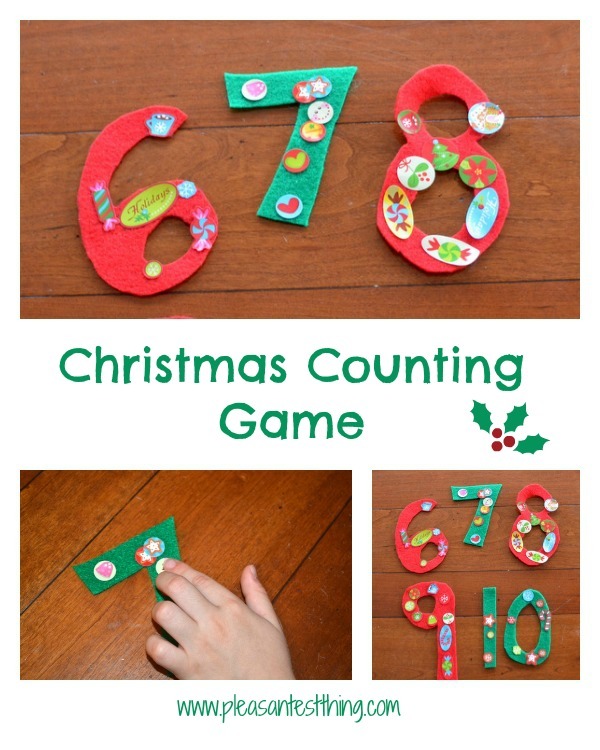 For a Christmas-y spin on math practice, we played a Christmas counting game, using red and green felt numbers and Christmas stickers. 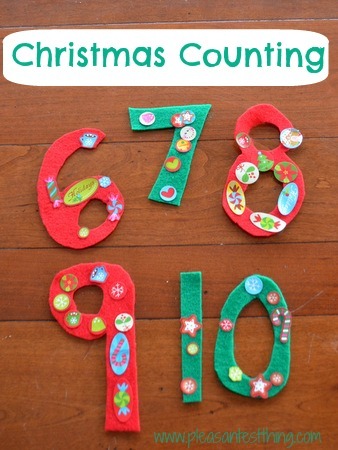 I cut the numbers out of felt, and then handed one to my preschooler. He first identified the number, and then placed that number of stickers onto the number. So when I handed him a felt 7, he put 7 stickers onto it. Then he gave me the number to count the stickers. Next, it was my turn. My son gave me a number, and I had to put the corresponding number of stickers on to the number. He would then check to make sure I added the right number of stickers. In addition to counting, this helped him connect what the numbers actually represent, and to visually see that numbers represent varying quantities of items. Sweeten the game: We played a few rounds with mini marshmallows. You could also try chocolate chips or Christmas foil wrapped Hershey’s kisses. For little ones: Pre-writers can play with the felt numbers, exploring the lines and turns in each one, tracing the numbers with their fingers.